Most novels have one ending. Author Salleh Kausari decides to go a different route with his novel, Misteri Mimpi Yana (MMY), published early this year by Terfaktab Media. 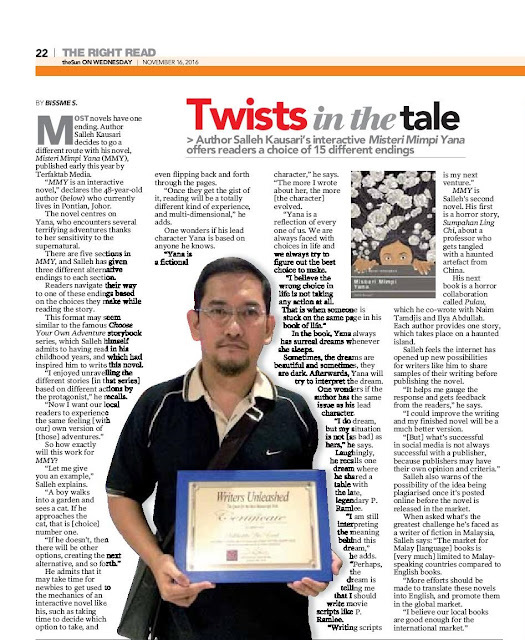 “MMY is an interactive novel,” declares the 48-year-old author (below) who currently lives in Pontian, Johor. The novel centres on Yana, who encounters several terrifying adventures thanks to her sensitivity to the supernatural. There are five sections in MMY, and Salleh has given three different alternative endings to each section. Readers navigate their way to one of these endings based on the choices they make while reading the story. This format may seem similar to the famous Choose Your Own Adventure storybook series, which Salleh himself admits to having read in his childhood years, and which had inspired him to write this novel. “I enjoyed unravelling the different stories [in that series] based on different actions by the protagonist,” he recalls. So how exactly will this work for MMY? “Let me give you an example,” Salleh explains. He admits that it may take time for newbies to get used to the mechanics of an interactive novel like his, such as taking time to decide which option to take, and even flipping back and forth through the pages. “Once they get the gist of it, reading will be a totally different kind of experience, and multi-dimensional,” he adds. One wonders if his lead character Yana is based on anyone he knows. “Yana is a fictional character,” he says. In the book, Yana always has surreal dreams whenever she sleeps. Sometimes, the dreams are beautiful and sometimes, they are dark. Afterwards, Yana will try to interpret the dream. One wonders if the author has the same issue as his lead character. “I do dream, but my situation is not [as bad] as hers,” he says. Laughingly, he recalls one dream where he shared a table with the late, legendary P. Ramlee. “I am still interpreting the meaning behind this dream,” he adds. “Perhaps, the dream is telling me that I should write movie scripts like P. Ramlee. 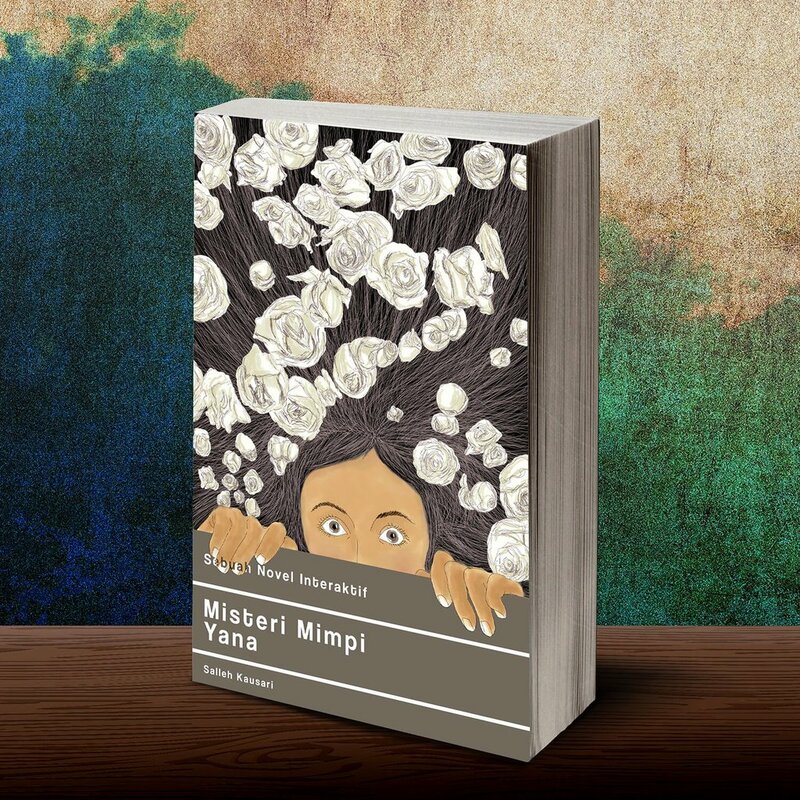 MMY is Salleh’s second novel. His first is a horror story, Sumpahan Ling Chi, about a professor who gets tangled with a haunted artefact from China. His next book is a horror collaboration called Pulau, which he co-wrote with Naim Tamdjis and Ilya Abdullah. Each author provides one story, which takes place on a haunted island. Salleh feels the internet has opened up new possibilities for writers like him to share samples of their writing before publishing the novel. “It helps me gauge the response and gets feedback from the readers,” he says. Salleh also warns of the possibility of the idea being plagiarised once it’s posted online before the novel is released in the market. When asked what’s the greatest challenge he’s faced as a writer of fiction in Malaysia, Salleh says: “The market for Malay [language] books is [very much] limited to Malay speaking countries compared to English books. “More efforts should be made to translate these novels into English, and promote them in the global market.